Frances Winston interviews Christine Bovill, whose show about Édith Piaf is intertwined with Christine’s own story, at The Olympia Theatre in Dublin, from tonight, 9th, to 14th November. For a gregarious, cheerful, jazz aficionado from Glasgow, tragic French singer, Édith Piaf, may not seem like the most obvious choice of inspiration. 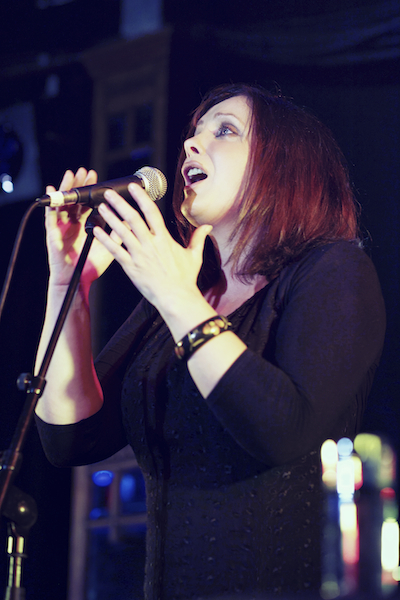 However, for Christine Bovill, she has become very much a part of her life. Her show, Christine Bovill’s Piaf, which she brings to Dublin’s Olympia Theatre from the 9-14 November, sees her intertwine her life with that of Piaf’s, while singing the songs made famous by the legendary chanteuse, known affectionately as The Little Sparrow. Christine’s love affair with Piaf is one that she jokes began “400 years ago”. “I used to collect and listen to jazz records, and an Irish friend said I should listen to this singer called Édith Piaf, and I can trace the moment where I heard her singing ‘No Regrets’ as the beginning of my obsession”. Of course, since Piaf tragically died in 1963, just a couple of months shy of her 48th birthday, many of the people attending Christine’s shows are unlikely to have ever seen her live, and she admits that some people are surprised to realise that she’s not a tribute show. “This is very much my story intertwined with her songs and story. It’s different every night as it’s just me singing and talking, and although there is a structure it can change. They seem to get a surprise as well when I sing in French, and I get a lot of people telling me that their husband or wife was the fan and that they didn’t actually realise how many of her songs they knew,” she remarks. Having toured Ireland three times previously to huge acclaim, this is her first time performing in Dublin’s Olympia Theatre, something which she is very excited about. However, while the Olympia does have an intimate feel, it is not quite as up close and personal with the audience as some of the other venues she has played in the past. Which begs the question: Does this torch singer prefer being able to see the whites of her audiences eyes in an intimate venue, or just looking out into the blackness knowing they are there in a large theatre. “That’s a very good question,” she ponders. “I mean they’re both very different. I’d like to think that I’ve polished the show [so] that it feels very intimate no matter where you are seeing it. The thing is you’re very vulnerable up there. You’re putting yourself out there, and it’s a lonely place to be up there on a stage on your own. There is something of a luxury at looking out at a sea of blackness but knowing that the audience is there. I think it’s much more difficult to perform in intimate venues, but on the other hand I love that intimacy. They both have their merits,” she says diplomatically. “I never really think of it. It’s not something I have consciously gone after. I know that Piaf does have a large following in the gay community so maybe I should focus on that a bit more”. “I’m in talks with a management company in London and they are looking at putting together a tour next year where I’d get to do my stuff and the Piaf stuff in the same show in [a] West End show. Kind of an introducing Christine Bovill thing”. Exciting times indeed for Christine. But in the meantime, she is set to entertain audiences during her run in the Olympia, and she couldn’t be happier.